Sharekhan Trade Tiger is one of the foremost names that come to mind when we talk about the top terminal trading applications in India. The application has been around for a while and has seen a fair bit of upgradations since its launch. Let’s review this trading application and decide whether it is suitable for your trading style or not. Sharekhan is one of the oldest names in the full-service stockbroking space in India with its inception going back to early 2000s. It is known for high brand trust, wide offline coverage through its sub-broker network and not to forget, its trading platforms especially Sharekhan Trade Tiger. 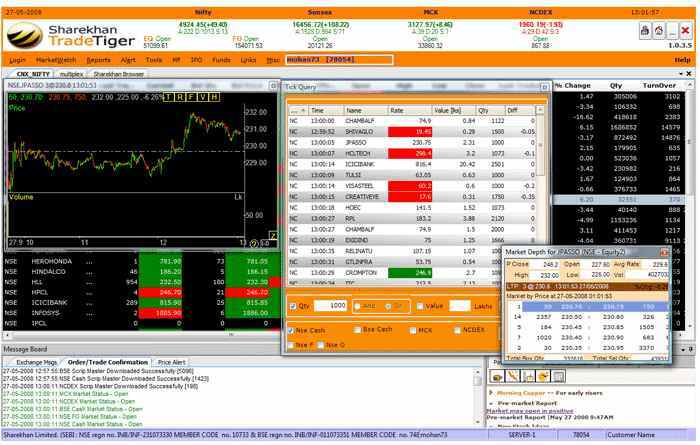 Trade Tiger is a terminal based trading software that user needs to download and install onto a desktop or a laptop. It lets you trade and invest across segments including Equity, Currency, Commodity and Derivative Trading. The best part of using Sharekhan Trade tiger is its performance capabilities that let you trade in a seamless manner. Sharekhan has lakhs of clients and most of those use Sharekhan Trade tiger as their preferred trading platform. In this detailed review, we will go through the different features this application has to offer before talking about the benefits and concerns it offers along. Sharekhan Trade tiger is an exhaustive trading platform (in terms of the features it provides) with something for every kind of a user, be it a beginner or an expert, heavy trader. Users can create multiple market watchlists with provision to add different trading and investment instruments at the same time. Shortcut keys for easy and preferable access to different features. This helps to improve the overall user experience and tap into the opportunities at the right time. This feature is most useful for intraday and swing traders who have limited time to afford. Charting functionality with indicators for both technical as well fundamental analysis. The terminal software provides a range of 30 to 90 daily charts along with around 30 technical indicators (although the number of indicators should be increased ideally) for a detailed analysis. You can plot target, entry as well as exit lines using various drawing tools available within the application. In-built functionality and access to reports, tips and recommendations from the research desk of Sharekhan. Integration with 14 banks for online funds transfer to the trading account. The stockbroker is working towards increasing the number of banks. Here is a quick review of the Sharekhan banks list. Get direct stock market feeds on a real-time basis across NSE, BSE, MCX etc using Sharekhan Trade Tiger. Different calculators such as Brokerage calculator, Span calculator, Premium calculator etc. 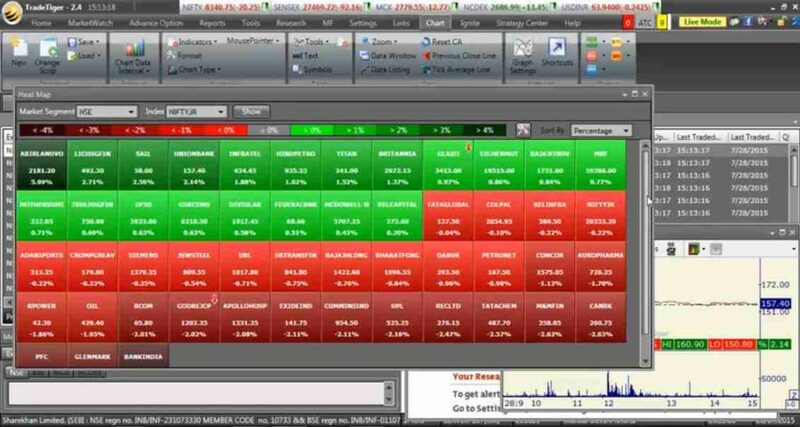 Stock scanners and heatmaps for quick analysis without digging into unnecessary information. While using these scanners, you can find out numerous trading opportunities using technical parameters such as Super trend or RSI etc. API integration is available for external platforms such as Amibroker etc. Usage of multiple types of orders including bracket order, AMO (After Market Order) is allowed. You can customize and personalize Sharekhan Trade Tiger as per your requirements with 5 language options, 4 theme layouts, shortcuts etc. 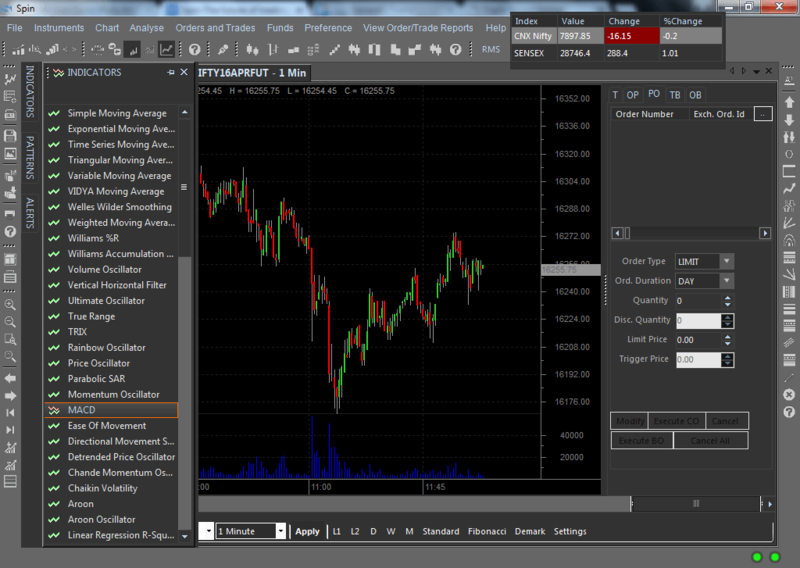 Relatively a heavy trading software, so it requires relatively decent machine configuration for smooth operations. One has to be very careful while running the updates sometimes, as issues in accessing charting functionalities have been noticed once an upgrade is done. Known for high performance and speed, Trade tiger is apt for users who look to trade specifically at intraday level. 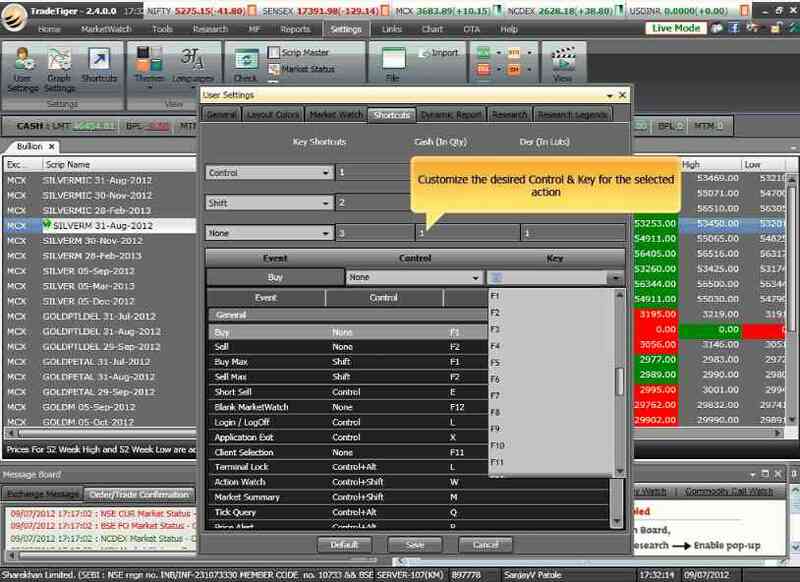 You can place bulk orders in one go with a provision to add stop-loss, entry and target price. Numerous types of charts and indicators available for technical analysis to go along with heatmaps. These are some important features for users who look to perform their own analysis. Real-time access to news, tips, trading calls works for traders who are starting afresh and need an initial handholding. These research reports and recommendations are provided at both fundamental as well as technical levels. 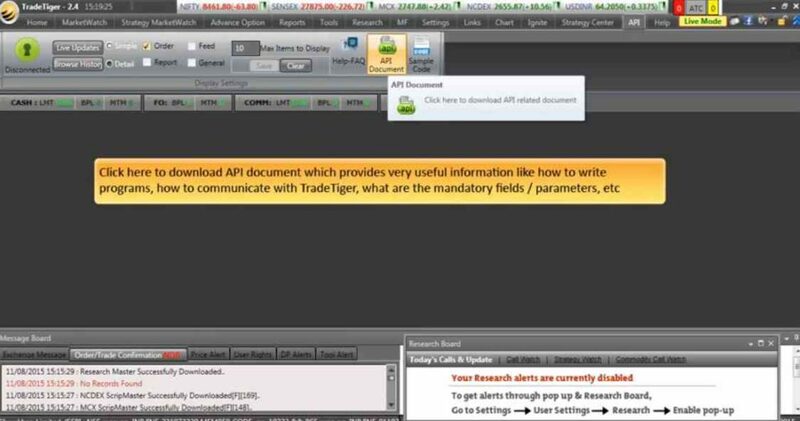 Video Tutorials available for users to understand how each and every feature of Sharekhan Trade tiger works. It comes pre-loaded with 30+ trading strategies. Direct integration with third-party analysis softwares allowed with this trading platform. 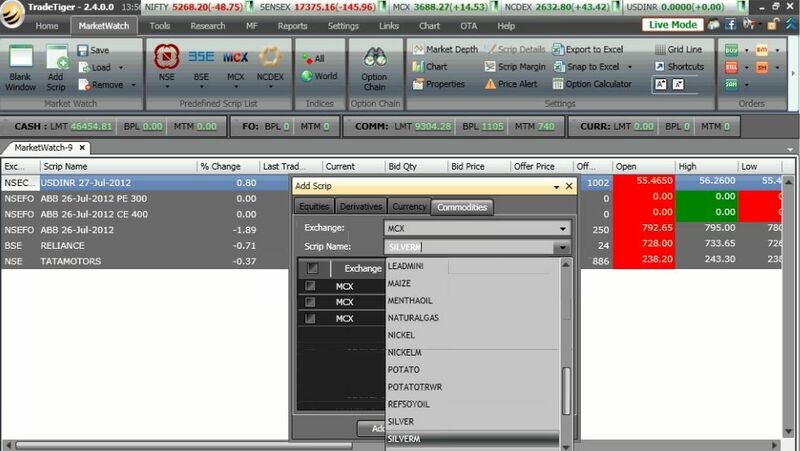 For instance, you can integrate your trading strategies written in software such as Amibroker with Sharekhan Trade tiger. If you are more comfortable using an excel, you can export live market data into an excel sheet and then directly place orders using that integrated excel sheet. While we wrap up this review on Sharekhan trade tiger, here are some parting thoughts. The application suits you well if you have even a limited but some prior trading experience. For an experienced trader, the application is definitely an upgrade especially if you have been using a basic trading platform. However, if you are a complete beginner – then you may need to spend some time initially to understand how the application works. This is primarily because of the wide range of features the application has to offer, thereby, it may overwhelm or even confuse you initially. Having said that, the platform becomes easy to use and certainly less number of hassles in your trades.